The oldest buildings in Rome are religious. The temples dedicated to Jupiter, Juneau and Minerva are located on Mount Olympia. The models on display show that the temple is broad, but not large and majestic, with steep, sloping roofs.It inherited the architectural and decorative traditions of its Roman ancestor, the Etruscan, and began to draw on the architectural styles of the Greeks. As Roman supremacy took hold, distinctive Roman-style buildings took shape over the centuries until the 2nd century BC, when Roman monuments were built using locally available stones and roofed with terracotta tiles.For large areas of the building's exterior and steps, builders began using a mixture of sand and mortar that gradually evolved into concrete, which played a vital role in Roman architecture. 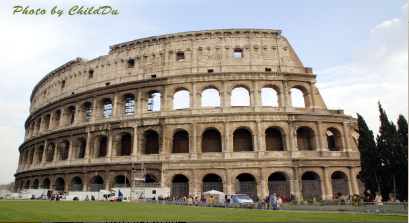 The architectural art of ancient Rome is theinheritanceand development of the ancient Greek architectural art. This "inheritance" is not only from the time successively, but also from the fundamental style of the architectural art. The content of this fundamental style is human consciousness and human scale.However, this kind of human consciousness and human scale, in ancient Roman architecture has a new meaning, it is this new meaning, the ancient Roman architectural art in the ancient Greek architectural art based on the stride forward.If the ancient Greeks worshipped people through the worship of "God" to reflect the words, then the ancient Romans worship of people, is more inclined to secular, realistic worship of the direct performance of people, the expression of human consciousness, has also been transferred from the group to the individual, "the emphasis on personal praise and material enjoyment of life. "It was under the influence of such a consciousness that the architecture of ancient Rome not only developed the brilliant achievements of ancient Greek art with the help of more advanced technical means, but also transferred the harmonious, perfect and lofty characteristics of the artistic style of ancient Greek architecture from the "temple" to the secular world under the new social and cultural background, endowing this style with a brand-new aesthetic interest and corresponding formal characteristics.In his Ten Books on Architecture, the ancient Roman architectural theorist Vitruvius pointed out that the basic principles of architecture should be "regulation, arrangement, symmetry, equilibrium, expediency and economy". This can be said to be a theoretical summary of the characteristics of ancient Roman architecture and its artistic style.Among these features, there is obviously still the harmonious, perfect and lofty style content of ancient Greek architecture, but the lever of "expediency and economy" obviously transforms the "divine" meaning of the ancient Greek architectural style into the worldly ideal.The point can be seen directly from the design of the type of architecture and the appearance of the building. The most splendid and artistic buildings of ancient Rome were those which served the economy or the life (material, spiritual) of man, such as squares, roads, bridges, elevated water channels, tunnels, theatres, arenas, baths, dwellings, and villas, almost all of which served the material life or spiritual enjoyment of man directly.In terms of artistic style, they also pursue harmony, perfection and sublimity, but they are no longer a "sacred" harmony, perfection and sublimity, but a "proper" in real life, a kind of economic prosperity, peace and stability, and the "sublime" in the pursuit of realistic stimulation. The ancient Rome architecture art achievement is very high. The large-scale building style is vigorous and dignified, the composition is harmonious unification, the form is diverse. The Roman has opened up the new architecture art domain, has enriched the architecture art technique.其The most important of these are: (1) the newly created interior space under the cover of the arches, the single space of the stately Pantheon, the sequential combination space of the multi-level and varied royal baths, and the unidirectional depth space of Basilica. (2) Development of the composition of the ancient Greek column to make it more adaptable. The most significant is to create a column with the combination of arches, such as coupons and continuous coupons, both for the structure, but also for decoration. The Empire around the Arc de Triomphe, most of the vote column composition. (3)In the first half of the 2nd century, Hadrian's Palace, which was built on the outskirts of Rome, is a mature example. In the roof modeling, the ancient Romans greatly revolutionized the ancient Greek architectural modeling method, will be used in ancient Greece beam structure, replaced by a more effective method of supporting the arch coupons, thus in the roof modeling, the ancient Greek architecture is difficult to see in the "dome arch" roof.In the roof modeling, the ancient Romans greatly revolutionized the ancient Greek architectural modeling method, will be used in ancient Greece beam structure, replaced by a more effective method of supporting the arch coupons, thus in the roof modeling, the ancient Greek architecture is difficult to see in the "dome arch" roof.Because of its economy, practicality and aesthetic effect, the structure is not only applied to special buildings such as temples and palaces, but also extends to all areas of daily life, such as roads, bridges, waterways, ports, theatres, houses, warehouses and sewers.So that many magnificent buildings in the performance of harmony, perfection, lofty, at the same time, with a clear "round" flavor. But at the same time, the ancient Roman architecture in the modeling aspects consciously draw on and inherit the general characteristics of the ancient Greek architectural style, especially the use of the colonnade, often distinctive performance of the ancient Roman architecture and ancient Greek architectural succession relationship. 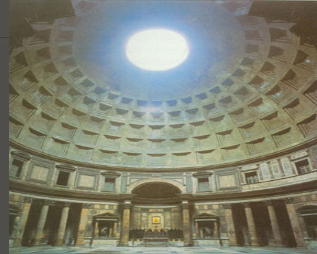 The Pantheon adopted a centralized form of dome covering. The rebuilt Pantheon represented a single space, concentrated structure, and was the highest representative of Roman dome technology.The Pantheon was flat and round, with a dome measuring 43.3 metres in diameter and a top height of 43.3 metres.In the middle of the dome is a garden cave 8.9 metres in diameter, which may indicate some connection between the world of God and the world of man. From the garden cave comes a soft diffuse light that illuminates the spacious interior, with an air of religious serenity. The outside of the dome is covered with a layer of gilded bronze shingles. 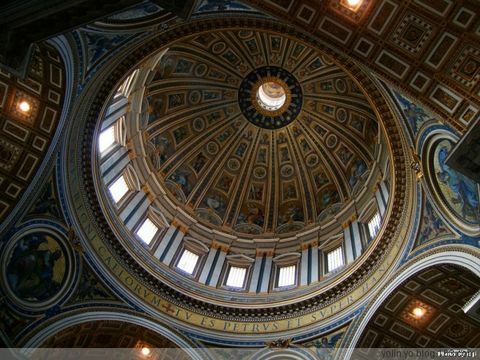 The dome is made of concrete, with bricks, and concrete is made of pumice as aggregate. It is probably built with bricks along the spherical surface before concrete is poured. The purpose of these coupons is to allow concrete to be cast in sections and to prevent concrete from slipping before setting, and to avoid cracks when concrete shrinks.To reduce the weight of the dome, the dome is thinner and thinner, with a thickness of 5.9 m at the bottom and 1.5 m at the top, and five deep grooves are made on the inside of the dome, 28 on each turn. The wall is 6.2 m thick and is also concrete. For every 1 m or so of pouring, a large block of brick is built. Eight large bills are issued along the circumference of the wall. Seven of them are niches and one is a gate. The niches and gates also lighten the burden on the foundation. The foundation is 4.5 m deep and the base is 7.3 m thick. The foundation and the concrete of the wall is made of tuff and ash stone. 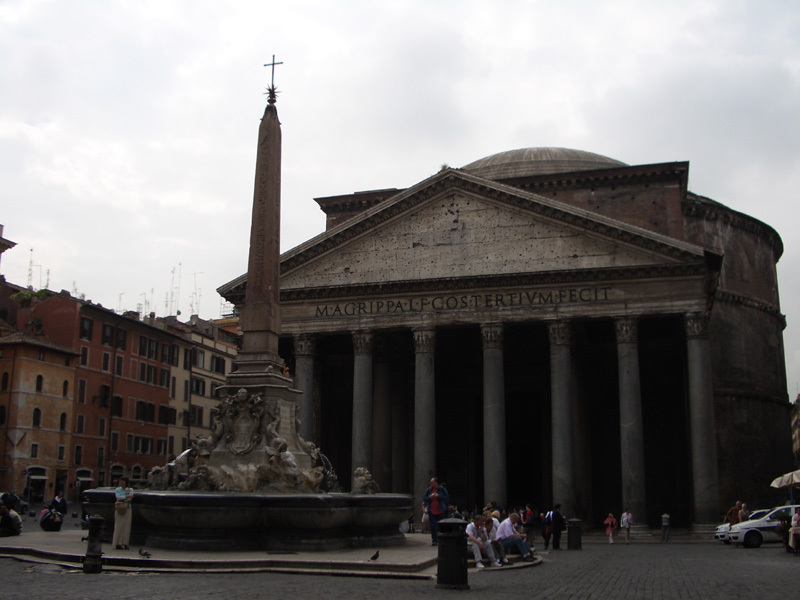 The Pantheon Gateway is a grand and ornate example of the typical style of Roman architecture. It is 33 metres wide with a rectangular colonnade facing it, 34 metres wide and 15.5 metres deep. It has 16 Corinthian pillars in three rows, eight in the front row and four in the middle and four in the back row.The column is 14.18 metres in height and 1.43 metres in diameter. It is made of a whole block of Egyptian grey granite. The pillar and foundation are white marble. Statues of mountain flowers and eaves, large doors, tiles, ceiling beams and panels in the porch are all made of copper and wrapped in gold foil.The world record for the Grand Dome of the Pantheon, with a diameter of 43.4 metres, was not broken until 1960 by the new Grand Dome, built in Rome, with a diameter of 100 metres. The outer wall is divided into three layers, the lower layer is covered with white marble, the upper two layers are plastered, and the third layer may be decorated with thin-walled columns. The lower two layers are the walls, and the third layer encloses the lower part of the dome, so that the dome is not fully manifested.This was probably intended, first, to reduce the effect of the side thrust of the dome; secondly, to make the walls taller and more symmetrical; and thirdly, to have neither the artistic experience nor the aesthetic habit of dealing with the full dome at that time. The temple itself has a rectangular faade, a circular plane, and a domed hall with eight huge vaulted pillars inside. The largest dome in the ancient world, with a diameter of 43.3 metres and a central light dome with a diameter of 8.92 metres, is the only entry point for the entire building.The hall is also 43.3m in diameter and height, with its 6.2m thick walls and massive brick but windowless columns. The Pantheon is said to be the first Roman building to focus on interior decoration over exterior styling, but some of the original bronze and marble carvings have been lost to foreign plunder or to later Roman constructions.The two bronze gates at the entrance to the temple are the original objects that still exist today. The gate was 7 meters high, wide and thick, and was the largest bronze gate in the world at that time. The famous Roman Colosseum, its perfect, harmonious, lofty shape, because it is associated with its functional tragic meaning, is bathed in slave blood tears of a noble, so that this kind of sublime, perfect, more secular, it can be praised, exciting, but difficult to produce like the Greek temple of the kind of "sacred" feeling.Can be said to be the Roman architectural style of harmony, perfection, lofty and ancient Greek architectural style of the biggest difference. The exterior faade of the Colosseum, especially the four-storey faade, is a replica of the Greek columnar composition, with the Doric column on the ground floor, the Ionic column on the second floor, the Corinthian column on the third floor, and the wall around the top floor.However, this type of pillar in ancient Greece, in this masterpiece in ancient Rome is no longer as in ancient Greece as the structure of the role of the structure has been transformed into a simple decoration, the real structure of the structure is hidden in the walls of the structure of the Roman Colosseum built of stone (188 meters long; 156 meters wide; 57 meters high), by a special limestone (100,000 cubic meters, from the Roman Colosseum, it is the largest quarry to the Colosseum around the Roman Colosseum, the Colosseum to the Colosseum.About 300 tons of iron is believed to be used to make grappling hooks that connect the stones. 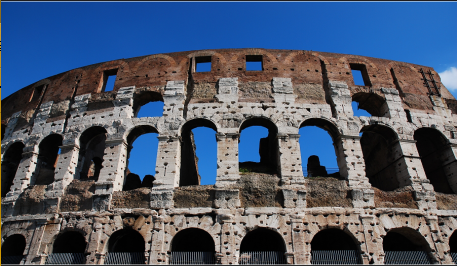 Externally, the Colosseum consists of a series of three-story circular arcades, the tallest of which is the penthouse. The stone pillars in these three arcades are designed according to classic standards (starting with the ground, Dorian, Ionian and Corinthian).Under the eaves of the fourth floor stood 240 hollow protrusions, which were used to place sticks to support the Velarium, the sunshade canvas of the amphitheater, which the Royal Fleet sailors helped to prop up to help spectators escape the heat, rain and cold, making the Coliseum a transparent first-century arena roof. The Colosseum can hold an audience of about 80,000 people. There are three levels of seating; the lower, middle and upper levels, and a standing-only stand on the top floor for the least privileged members of society: women, slaves, and the poor.But even on the other floors, the seats were arranged according to social and professional status: special boxes owned by members of the royal family and the chaste women guarding the flame. Seniors in white red-edged robes sat in the "choir" on the same floor; then there were warriors and civiliansViewers enter the Colosseum from 80 arches on the first floor, and 160 exits are located at each level, called spits, through which spectators can pour in and out, allowing chaotic and out-of-control crowds to be quickly evacuated. The form of ancient Roman secular architecture is quite mature and well integrated with its functions. Large theatres throughout the Roman Empire, for example, have semi-circular auditoriums, rising in rows, dominated by vertical aisles and supplemented by horizontal aisles. Spectators follow the ticket numbers to reach the seats in the districts from different entrances and stairways.The stage is high, there is a music pool in front, behind is the make-up building, the faade of the make-up building is the background of the stage, the two ends protruding forward, the formation of Taiwan mouth rudimentary shape, with the modern large-scale performance building similar to the basic shape. The historical significance of ancient Roman architecture is that it formed a new form of some buildings, such as theatres, Basilica, Christian churches, etc., created a large and complex organization of the internal space approach, into the bathroom palace, produced some compositional techniques, such as coupon column, stacking column, the treatment of large monuments, etc.It skillfully used the ancient construction techniques, the achievements of Roman architecture is a collection of Greece, Asia Minor, Syria and other places of great achievements, Western European countries to inherit the building of the Roman tradition as the norm.The architectural design of Rome is still applicable now, because the Romans pay great attention to practicality in the aspect of architectural technology. The ancient Rome shows the characteristics of both pragmatism and aesthetic taste in the history of architectural art. It has laid a solid foundation for the development of western modern architecture in terms of architectural technology and aesthetic standards.